Tropical gardens lift our spirits and transport us into magical, exotic places such as Hawaii, Bali, Florida’s Keys, the Bahamas and beyond. Although not everyone wants a completely tropical backyard, the beauty of tropical plants is undeniable. The addition of tropical plants to your garden may bring you one step closer to your dream of these wonderful faraway places. When you think of tropical, what comes to mind? Large-leaf foliage plants, spectacular splashes of colorful flowers, exotic looking flowers and foliage. The tropical look has been aptly described as “flamboyant in form and contrast.” As you read this article, release your biases regarding the uses of tropical plants. 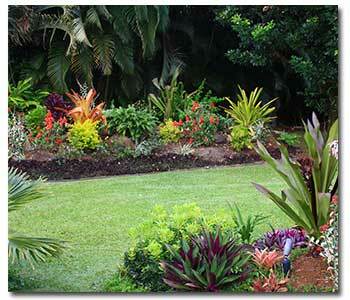 Imagine ways that you can introduce your favorite tropical into your cottage garden or classic garden. We think that you will find the perfect location for your favorite one. Alternatively, tropical garden lovers, discover other plants not classically considered “tropical” and put them into your garden–and you’ll love the effect. Abutilon is excellent for this. Tibouchina (princess flower), acuba, fuchsia, camellia and impatiens are other plants that help you think out of the tropical plant box. From the horticultural point of view, “tropical” means a plant that cannot sustain freezing temperatures. So, not all plants so defined will have that lush tropical look, will they! Actually, there are “tropical” desert plants too, including cactus and succulents. Tropical plants exemplified in this article may be included simply because they are tropical looking. And some plants may also be drought tolerant and not from what we consider a classic tropical locale. But blended together, they create that exotic tropical look. Plant them into your garden, whatever its style may be…Well, keep in mind that plants can take on the characteristics of their surrounding plant neighbors. This is why we would encourage you, if your choice is not a tropical garden, to consider our tropical friends anyway. The variation in foliage color, textures and size will add a new element. Remember, in garden design, it is good to vary these elements to add interest to your garden borders. The tropical plant (and tropical-look plant) list is long and diverse. The list below names just a few. We’re sure you could think of just as many more! Trees: Bananas (musa and ensete), brugmansia (Angel’s Trumpet), palms, tree ferns, dracena, cassia, tibouchina, tupidanthus, schefflera, and feijoa (guava). Shrubs: Abutilon, acuba, brunsfelsia (Yesterday, Today and Tomorrow plant), ferns, philodendrons, hibiscus, fatsia, gardenia, iresine, justicia,and strelitzia (Bird of Paradise). Vines: Burmese honeysuckle, bougainvillea, tecoma (yellow trumpet flowers), Distictus (trumpet flowers), and passion flower vines. Grasses: Cyperus (papyrus), sedges, bamboo, and liriope. Miscellaneous: Aloe, begonia (rex hybrids), clivia, plumeria, bromeliads, fuchsia, and impatiens. Are you able to find a perfect place in your garden for any one of these?